While most research on animal movement takes place in the laboratory, animals exist in a complex environment in which they must navigate many challenges. We apply cutting edge technologies and techniques to both understand how animals move in nature, but why they move the way they do. One of the most basic questions in animal ecololgy is which environmental factors determine how animals move in nature. Many studies have examined animal locomotion under standardized laboratory conditions, but few have examined animal movement in nature, or have addressed which factors influence it. In both tropical and desert environments, we have examined how locomotion in lizards is influenced by many different environmental variables, such as the incline of hills (see below), perch diameter and height, and many other variables. Another question that is vitally important is what percentage of their maximum capacities do animals use in nature? Do animals always run at 100% of their capacities, or at only a small fraction of their abilities? Using video technology and tracking of footprints in the sand, we have been able to reconstruct in great detail the movements of these animals, and also determine which variables influence how fast they move, and what kind of locomotion they use. Together, this approach is a powerful and novel method that enables us to clearly understand the impacts of the environment on animal movement. Irschick DJ, Losos JB. 1998. A comparative analysis of the ecological significance of locomotor performance in Caribbean Anolis lizards. Evolution. 52:219-226. Jayne BC, Irschick DJ. 2000. 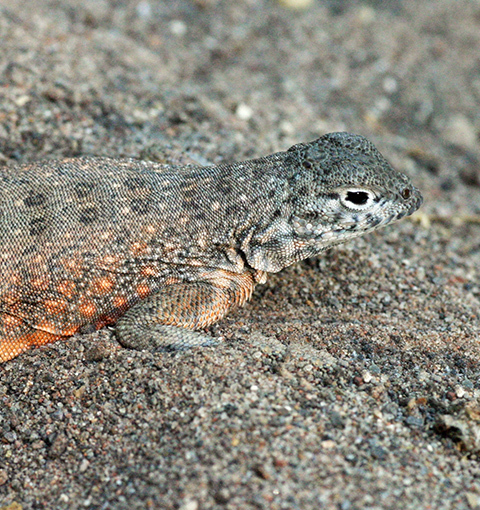 A field study of incline use and preferred speeds for the locomotion of lizards. Ecology. 81:126-14. Featured in the "Biomechanics" section of the magazine "Natural History" Sand-dune two step. Irschick DJ, Garland T. Jr. 2001. Integrating function and ecology in studies of adaptation: Investigations of locomotor capacity as a model system. Annual Reviews of Ecology and Systematics. 32:367-396. Irschick DJ. 2003. Studying performance in nature: Implications for fitness variation within populations. Integrative and Comparative Biology. 43:396-407. Irschick DJ, Herrel A, VanHooydonck B, Huyghe K, Van Damme R. 2005. Locomotor compensation creates a mismatch between laboratory and field estimates of escape speed in lizards: A cautionary tale for performance to fitness studies. Evolution (Cover). 59:1579-1587. Gilman C, Irschick DJ. 2013. Foils of flexion: the effects of perch compliance on lizard locomotion and perch choice in the wild. Functional Ecology. 27:374–381.